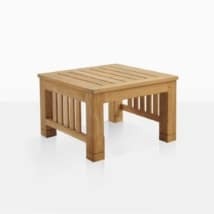 The Outdoor Ottoman from the Raffles Teak Outdoor Furniture set is muscular and sturdy. It’s the outdoor ottoman that feels like it can handle anything. 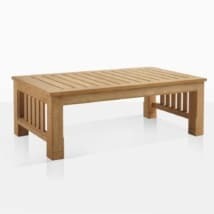 The short and prominent legs use the same hard to source Grade-A teak that is omnipresent in the Raffles Outdoor collection. The beefy design of this outdoor ottoman offers such a solid base and a wide area to sit on; this is enhanced only by the comfort of the substantial Sunbrella® cushion that fits the surface dimensions perfectly. 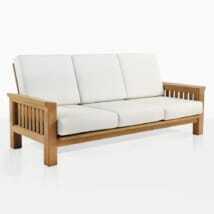 The teak dimensions are 28 inches wide by 28 inches, and 16 inches tall. With the added 6+ inches of the cushion, this platform has just become your kids’ favorite place to sit. These dimensions don’t only make this teak ottoman the perfect ottoman to use as an extra seat, but the perfect way to enhance the comfort of your existing Raffles seating pieces. 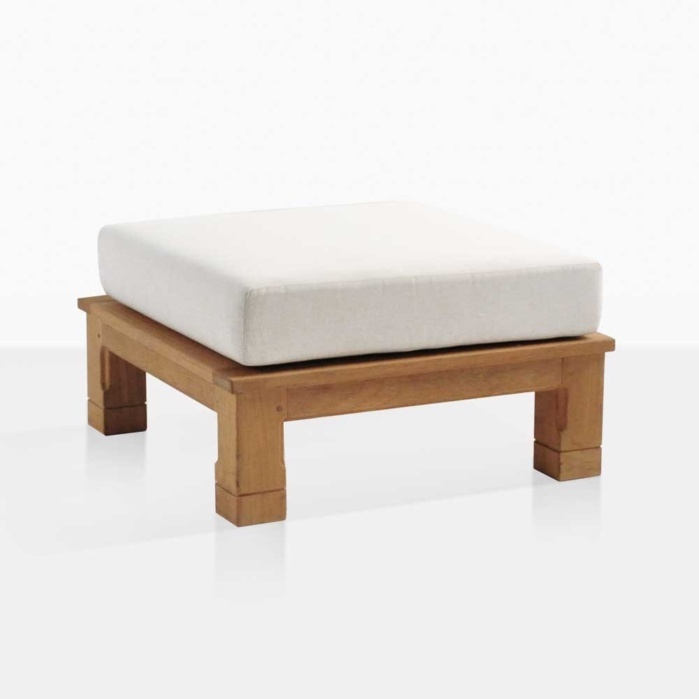 As a footrest, this piece provides impressive comfort and durability. 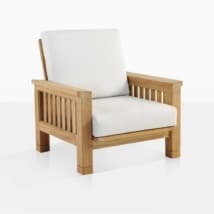 W28" x D28" x H16"
The teak sizing isn’t compromised just because an outdoor ottoman isn’t a centerpiece type of outdoor furniture. 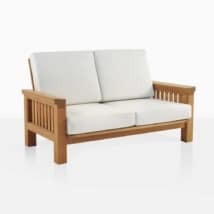 That same confidence of the Raffles Teak Outdoor Furniture Collection’s more obvious pieces comes through with the 3 inch teak wood boards and the squared but nicely tailored edges. That same Mission style versatility and boldness comes through whether it’s covered with the cushion or the teak is on full display. Those who know the importance of a husky and utilitarian outdoor ottoman should enjoy this teak accessory piece.